Does the clinic have alternate ways of communications for patients that speak a different language other than English, literacy issues or a disability? Clinical staff assess health literacy levels to determine how to communicate best with the patient and their caregivers. No. Community Healthcare Center is not a “free clinic.” The Center offers the uninsured and underinsured discounted fees based on household income and family size. In-house eligibility specialists work with patients to determine qualification for services and ability to pay. The Wichita County Indigent Health Care Program is designed to care for county residents with no insurance, who are not Medicaid eligible and meet resource and income requirements. Can I fill a prescription at Community Healthcare Center pharmacy if I saw a doctor at a different clinic or hospital? Only patients seen at Community Healthcare Center, or those having prescriptions filled by a specialist after first seeing a Center care provider, may have their prescriptions filled at the facility. Prescription drug prices at the Center are discounted consistent with the mission to serve the uninsured, underinsured and low-income area populations. Lab work and x-rays are also reserved for Center patients. Do you have bilingual providers? Si (yes)! Many of our front office staff, nursing department and even some providers speak Spanish. The Center uses a translation service for patients requiring assistance in languages other than English or Spanish. Does Community HealthCare Center have an emergency room? No. The Center is an urgent, primary care clinic, not an emergency care facility. Our focus is on preventive care. How is this clinic different from other clinics? Community Healthcare Center is a 501(c)3 private, non-profit, charitable organization providing affordable healthcare for the uninsured, under-insured, and low-income. It is the only Federally Qualified Health Center (FQHC) in north central Texas. The Center has the distinction of being a FQHC because, among other reasons, it is located in a Medically Underserved Area (i.e. an area with documented shortages of healthcare services) as identified by the federal government. This health center is a Health Center Program grantee under 42 U.S.C. 254b, and a deemed Public Health Service employee under 42 U.S.C. 233(g)-(n). I am a supervisor at a Wichita County business; many of my employees cannot afford health insurance for themselves or their families. Can Community Healthcare Center help? Community Healthcare Center is more than a clinic – it’s a resource. As healthcare and prescription drug costs continue to escalate, businesses are seeking high quality, affordable alternatives. Community Healthcare Center can provide employees and their families with quality medical and dental care and inexpensive prescription medications at an affordable price. Healthy employees with healthy families are more productive and absent less. And for those with private insurance, Community Healthcare Center offers a friendly, compassionate alternative to monolithic health facilities. Over half of the Center’s Board of Directors are consumers of its first-rate services. I was coming to Community Healthcare Center when I was uninsured. Now that I have insurance, can I continue coming? Absolutely! Center providers treat patients regardless of their insurance status and we welcome both the insured and uninsured alike. We hope you have been satisfied with the quality of care you have received and will continue seeing your provider now that you are fortunate enough to have insurance. We welcome Medicaid, Medicare (Medical), CHIP, TRICARE and most private insurance. 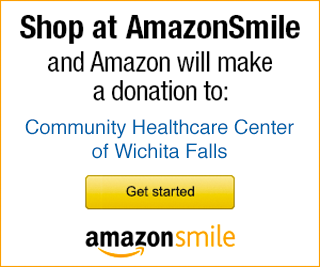 Is Community Healthcare Center part of the Wichita Falls – Wichita County Public Health District? No. Community Healthcare Center is an independent network of primary care clinics and is not part of any city or county agency. Center care providers, like most professionals, are busy people with jam-packed schedules. Some providers are booked for months out. Patients who skip appointments with Center care providers or specialists referred by the facility, regardless of the reason the appointment was missed, run the risk of not being seen again for months and receiving a warning letter. Those who repeatedly skip appointments may forfeit their right to future service at the Center. Missed appointments represent one of the most substantial drains on Center efforts to service the greatest number of patients possible. What if Community Healthcare Center does not offer a medical or dental service, or prescription drug that I need? If a patient has seen a provider at Community Healthcare Center and requires a medical service (i.e. a medical procedure, visit to a specialist, etc.) the clinic does not provide, the Center’s referral department will assist the patient in scheduling an appointment with a specialist. If the drug prescribed to a patient by a Center provider is not available at the clinic’s pharmacy, the Center may attempt to order it. If the Center does not procure the drug, or if a patient prefers to get the prescription filled elsewhere, they may do so for any reason. What quality of services will a patient receive? Community Healthcare Center provides high quality medical and dental care and other support services. From the front office staff and clinicians, to referral specialists and corporate officers, every member of the Center team is committed to providing a safe and comfortable experience for patients. In acknowledgement of the Center’s effort to continually strive for excellence in patient care, it is recognized by both private and governmental agencies. The Center is accredited by the Joint Commission and has received its prestigious Primary Care Medical Home (PCMH) designation. It is accredited by the Health Resources Services Administration-Bureau of Primary Health Care. The Center is also a distinguished recipient of the Torch Award for Marketplace Excellence from the Better Business Bureau (BBB) of North Central Texas and a member in good standing. Where does the funding for Community Healthcare Center come from? Community Healthcare Center receives payments for services from Medicare, Medicaid, Children’s Health Insurance Program (CHIP), insurance companies, and individual patient cash payments. Grants from federal and state agencies, foundations, and corporations are also pursued. Individual donations are also gratefully accepted. Who is eligible for medical, dental and counseling services? Anyone can receive care at Community Healthcare Center. The Center welcomes all forms of insurance including Medicare (medical), Medicaid, CHIP, TRICARE and most insurance. Patients who are uninsured or underinsured can receive care by qualifying for discounted fees.